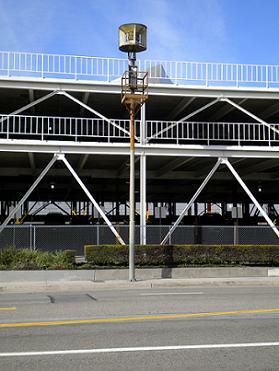 Southern California is known for wantonly erasing its past, so it’s a pleasant surprise to find that multiple World War II-era air raid sirens still stand. Here are two in downtown L.A., one at Broadway and Temple near the old Hall of Justice, left, the other on Olive and Second by the Music Center parking structure, below, the tip of Disney Hall poking up behind. Close to home, Claremont has one on Sixth Street east of Mills on the Claremont McKenna campus, next to the bottom. I’m relieved to know my city of residence is prepared in case of attack, perhaps by Montclair. UPDATE: As commenters below brought to my attention, Claremont has a second air raid siren, on Oxford Avenue between 10th and 11th streets. I’ve added a photo of it at the bottom. This website has photos of nine more in the L.A. area, including in Eagle Rock, MacArthur Park and near LACMA. 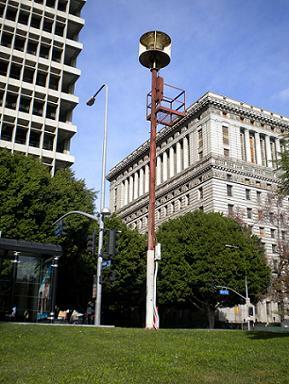 This page has photos of 38 L.A.-area sirens, albeit without the locations identified. More than anyone would ever want to know about air raid sirens can be found on this Wikipedia page. I believe Pomonas siren was located downtown on top of the First National Bank building that was located on the northwest corner of Second and Main streets. The building is still there; I wonder if the siren is also. I served as a volunteer member of the Aircraft Observer Corps while in high school in the early fifties. We scanned the sky from the roof of the building and reported any observed aircraft by telephone. I think I remember looking at the siren, but I cant say for sure. And don’t forget that Pomona has the tunnel from the PD to the courthouse which was fully equipped as an air raid shelter (don’t know about the condition of the shelter now). When it was dedicated in the ’60s, one of the original A-bomb scientists (I believe it was Edward Teller) was in attendance and spoke of the country’s most modern civil defense shelter. I believe there is one….or was one on Oxford and Tenth on the east side of the street in Claremont. This is very cool! I used to live in Rowland Heights and the Old Nike base was behind our home. I watched it basically deteriorate through the years but it was so neat to have something like that still around. I wonder if these still work. I remember all the duck and cover drills in school. We would file out of the classroom and line up against the hall walls. We were all afraid of a nuclear attack by the Soviet Union. My uncle even built a bomb shelter in his yard in Ontario and another one at his desert home. A teacher friend grew up in Long Beach during World War II, when there were blackouts at night along the coast. They even had to drive at night without headlights. When an air raid was anticipated, her father, who was vice-president of Signal-Hancock Oil Company, had to go to the oil fields, and she and her sister had to hide under the stairs at home. Fear of air raids was real. There was even an enemy shelling near Santa Barbara and another in Oregon. It is interesting that these reminders are still around. With regard to the whistles, General Electric blew whistles at noon and the end of the workday. I do not remember a morning whistle, but I probably was asleep anyway. Anyone anywhere in Ontario knew when lunch and quitting time were, not just the G.E. employees. Another “noon whistle” was at the Blue Seal Laundry (now Angelica, I believe), in downtown Pomona. I know this was still used in the 1970s, maybe even into the ’80s. As touched on by Linda, above, I believe this type of siren is cold war era, rather than World War II. I remember such installations in the mid-fifties. My mother was a member of the Ground Observer Corps in those days, watching for the Russians from the top of the tallest building in Whittier. I was in the Air Force, flying back and forth over the Pacific, doing the same thing, but from radar “picket” aircraft. 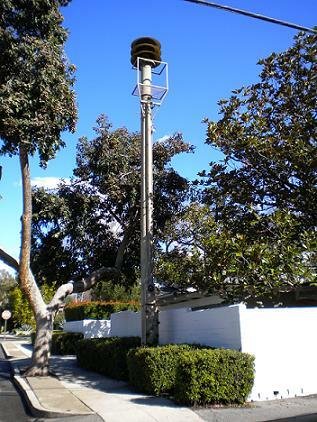 There is an air raid siren tower on Oxford Ave between Tenth and Eleventh streets in Claremont. When we first moved into the neighborhood it was tested at least once a year. After that program stopped it would go off occasionally as a prank. The controls were welded shut some time ago but the tower is still here! The noon whistle that Mr. Decker is talking about (Angelica Laundry) is still there. The smoke stack is gone but the steam whistle is still there. Interestingly, I was in Golden Gate Park last June and was somewhat baffled and a little disturbed to find that San Francisco still test their air raid sirens daily. Keeping the public in a mild state of discomfort and fear, perhaps? Can you identify a siren if I send you a pic? I am doing research on one in our town. 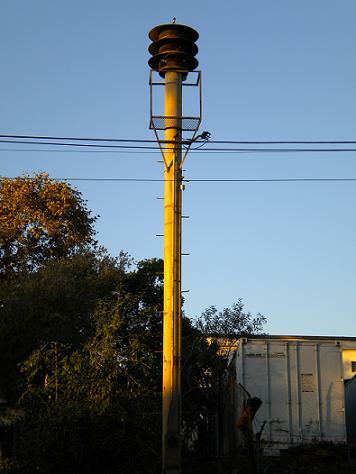 Wikipedia has an excellent entry on Civil Defense Sirens that will help identify various models and manufacturers. http://www.civildefensemuseum.com has more information and photos than you could ever want on sirens.